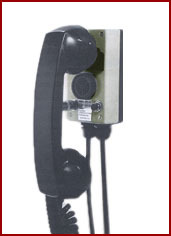 The SPS-210 wall-mounted intercom station, consisting of a sound powered handset and a battery powered signal, provides reliable communications over distances up to five miles, using a single pair of wires. 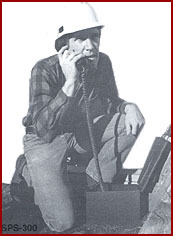 The SPS-300 Field Telephone is a portable version of the same station. Both use a very low drain signal providing for long battery life, usually in excess of two years. The carry-case for the SPS-300 is water-proof. These telephones are common-talk, common-ring. They may be used as pairs or hooked up in parallel to a practical limit of six stations. Frequently the SPS-210 is used as a central station connected to a string of jack boxes into which the SPS-300 may be plugged. The stations present no shock hazard and emit no radio-frequency interference. Allows for "splitting" extension and jumper cords. split leads with alligator clips.